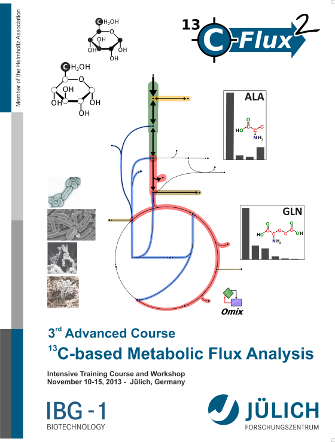 Advanced Courses on 13C-based Metabolic Flux Analysis will regularly take place at the IBG-1: Biotechnology. The intensive training courses feature mathematical modeling, the cutting-edge simulator 13CFLUX2 and all major topics relevant for the planning, analysis and planning of labeling experiments with emphasis on practical applications. Traditionally, the last day of the courses is dedicated to a scientific workshop presenting recent developments in 13C-MFA related technologies, ranging from quantitative metabolomics to information visualization techniques in systems biology. Our Advanced Courses on 13C-MFA are unique in bringing together experts from academia and industry, leaders in the field, together with junior faculty members, postdoctoral fellows and graduate students, interested in the in-depth assessment of the practical challenges involved with the 13C-MFA technology. Additionally, we aim to provide a forum for discussion of new developments and techniques in isotope-based flux analysis in all fields of biotechnology. The satellite workshop Visualization with Omix will take place prior the advanced course on November 7-8, 2013. The software Omix is a visualization tool for metabolic networks and customizable visualization framework for experimental and simulative data. Equipped by several features and tailored automatisms innovative drawing solutions support researchers from life sciences in communication of results. In particular, Omix provides a user-friendly, fully featured graphical modeling environment for 13CFLUX2 and 13C-MFA related modeling. Researchers looking for a solid theoretical and practical introduction to the state of the art in metabolic flux analysis with isotope labeling experiments, related software tools and modeling practices. The course content is taught in a balanced mixture of lectures and guided hands-on exercises in small classrooms. An (independent) satellite workshop on the visualization tool Omix® will take place prior the advanced course on November 7-8, 2013. Omix® provides a user-friendly, fully featured graphical modeling environment for 13CFLUX2 and 13C-MFA related modeling. "Just enough shell scripting and Perl for 13CFLUX2"
The "Just enough ... for 13CFLUX2" syllabus highlights the type of scripts commonly found in the materials that will be used throughout the course week. The visualization software Omix is a highly customizable editor for biochemical network diagrams, equipped with extensive data visualization features. Omix provides a powerful graphical modeling tool for the command-line based 13CFLUX2 simulator. The mini-course introduces basic capabilities of flux map visualization with Omix, in particular using the Omix Visualization Language OVL. Attendees should have wireless-cable laptops with ssh clients and administrators access. We will provide full access to the 13CFLUX2 simulator throughout the training week. The number of participants is restricted to a maximum of 12 participants in order to maintain the balance between the advisors and participants. Academic and corporate packages are available covering course material, lunches and the workshop dinner. The fees do not cover other meals and housing. A limited contingent of laptops can be provided on a first-come-first served basis. Additional 50 EUR will be charged if you do not bring your own laptop. Course fees are to be paid by credit card. The AC 13C-based MFA 2013 has been filled; registration is now closed. We maintain a waiting list. If you are interested to be placed on the list a short email to info@13cflux.net. There is a successor option for the case that space becomes available. Let us know whether you may be interested to make use of this option. If registration numbers are not sufficient by October 1st, the course may be cancelled. In the event of cancellation a full refund of registration fees will be issued to registered participants. Important note: If you have to cancel your registration or if someone else will take the course, please send an e-mail to the conference organizers (info@13cflux.net). Please note that your cancellation is not valid unless you have received a receipt confirmation by e-mail. Accommodation can be arranged on your request. In case of interest, please contact Mrs. Marianne Hess (m.hess@fz-juelich.de).